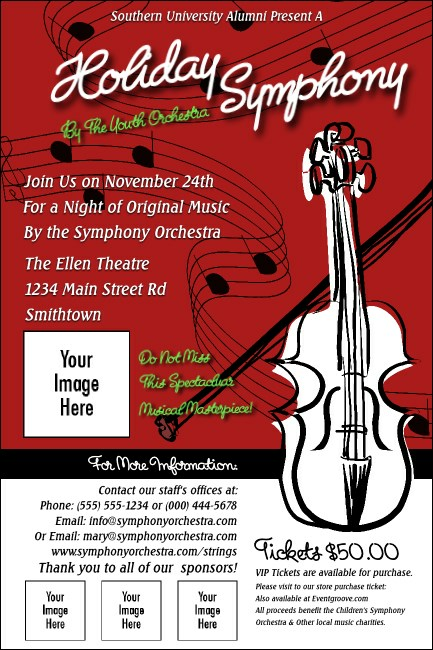 Orchestrate the best pre-event promotions you can find when you advertise in advance with String Symphony Posters. These Posters sing with musical influence and stylish beauty in a seasonal red background with floating scores of music. With a white violin and space to upload four unique images to the template, these Posters will help you make beautiful music. TicketPrinting.com helps you make sure no one misses the overture!